You may have a kitchen garden - but what about a garden kitchen? Embracing the growing trend for using terrariums and house plants around the home to bring your rooms to life, a new range of splashbacks gives you the chance to bring even more greenery inside. Okay, so it's not real greenery, but the plants and flowers hand-painted by decorative glass designer Emma Britton are realistic, unique – and the perfect way to add a joyful, decorative flourish to a kitchen or even a bathroom, spaces that often cry out for a bit of pattern. 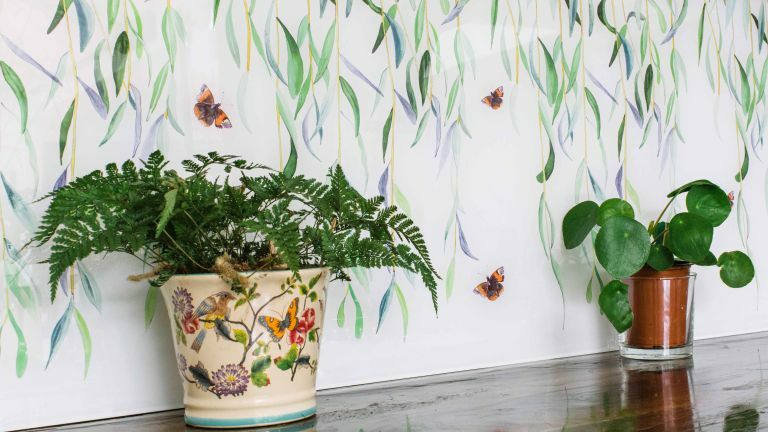 Inspired by opulent orangeries found in period country houses, the Glasshouse range features delicately hand-drawn, exotic blooms, including black iris, willow, orange crown imperial, Oxalis triangularis and pilea. With every design made-to-measure from toughened glass, and priced from £270 for a 600 x 600mm panel, they are a beautiful and unusual alternative to plain glass or tile designs.